Sievert Crane, located close to Chicago in Forest Park, is the premier source for hoist and crane products, and overhead material handling repairs / inspections, and parts / accessories. Cranes include top running, underhung, jib, and gantry. Hoists include electric chain, wire rope, air, manual and trolleys. Sievert Crane & Hoist is a Sievert Electric company. We have serviced the commercial and industrial market for over 100 years. Sievert Electric is the premier source for integrated project management and turnkey solutions for electrical construction, data / communications, and scoreboards / video displays. Sievert Crane & Hoist offers turnkey solutions for overhead material handling products and services. Sievert Electric, located close to Chicago in Forest Park, has serviced the commercial and industrial market for over 100 years for electrical construction, data and communications, and scoreboards and video displays. 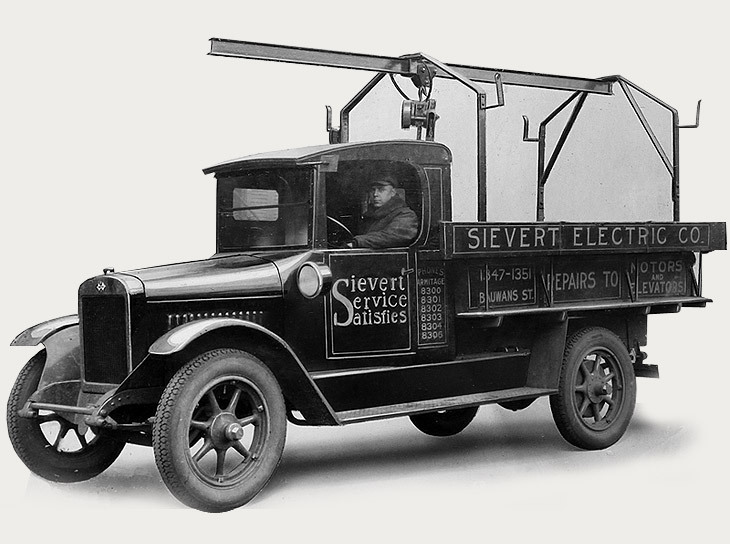 Sievert Electric was started in 1913 by C. A. Sievert. He had been an electrical apprentice in Germany, and as a young man and all alone he came to Chicago and in 1913 started a new business. It was called Sievert Electric, was located in what was then the German section of Chicago around Ashland, Milwaukee and Division, and focused on electric motor repair and rewinding. This was the dawn of a new industry, the electrical industry. It was a new technology and the future was limitless. Sievert Electric was a new company at the forefront of the newly emerging electrical industry. The company and the industry would grow together into the new century. In the late 1930's the company expanded into the manufacture of electric motors under the brand name Oak Electric. Starting around that same time Paul Sievert, C. A. 's son, took over the day to day operations of Sievert Electric. After World War II Sievert Electric partnered with Yale Hoist, and was the authorized master distributor for Yale hoists and overhead material handling products in the Midwest and the West. Sievert Electric has been a partner with Yale, one of the leading companies in the hoist and crane industry, for over 75 years. In the late 1950's the company expanded into electrical construction services. That time was the beginning of the high rise boom in downtown Chicago. Sievert Electric was the electrical contractor of choice for the majority of concrete high rise buildings in Chicago for a number of years. Pete Sievert, Paul's son, joined the company in 1971. For almost 50 years Pete has helped guide the company's electrical construction business, and expansion into other commercial / industrial / government markets. In 1978 Sievert Electric moved to a larger facility in Melrose Park. They continued to focus on the electrical construction business, and continued also in the distribution and repair / inspection of hoists and cranes and overhead material handling equipment. In 1987 the company moved to Forest Park, just west of Chicago and close to O'Hare Airport, the epicenter of the industrial / commercial Midwest. It was a significantly larger production facility that gave them added manufacturing and office space. In the 1990's the company expanded into two additional markets, data and communications, and also scoreboards and video displays. Data and communications includes wiring, video surveillance cameras, access control, security systems and telephony. Sievert Electric became the authorized distributor for Daktronics, the leading company in the scoreboard and video display market, and has served the K through 12 school market, and also the professional sports, park districts, and airport and transportation markets for over 25 years. Scott Sievert, Pete's son, joined the company in 2010, after graduating from the Air Force Academy in Colorado Springs and then serving in the U. S. Air Force for 10 years as a procurement officer. Today Sievert Electric is focused on integrated project management and turnkey solutions for the commercial and industrial markets for electrical construction, data / communications, and scoreboards / video displays, while also expanding into government services and major construction projects. We are proud to have delivered exceptional value to our customers, some of the biggest names in the commercial, industrial and government markets, for all these years. And we're just getting started. Today the crane and hoist division makes up 50% of Sievert and continues to provide crane and hoists all over the United States and the world.